Cashco Financial’s Quesnel, B.C., branch manager is dedicated not only to her job, but to bettering her community. Roni Lacey lives the Cashco Financial values every day. This is why she is our Cashco Care’s August Volunteer of the Month. We love hearing these stories from our employees, even better when we can get to know them a bit more personally. We asked Roni what inspired her to make a difference in her community. “Knowing I work for a company that allows us to time to care about our community on work time is reason enough to work here,” explained Roni through email. 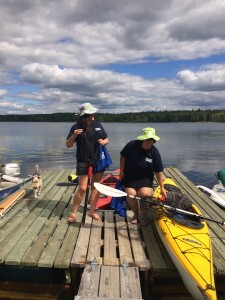 The Cashco Quesnel branch manager and her co-worker Marie recently spend the afternoon cleaning up Ten Mile Lake. Roni has been taking her kids to the lake for the past 18 years, and to see it covered in garbage from campers left her feeling discouraged. “I kayak this lake often. It’s my therapy and I always see garbage from campers left behind. This saddens me, so I wanted to become involved and make a difference rather than complaining”. Two ladies were on the lake for four and a half hours cleaning up garbage. “We didn’t kayak around the provincial park as we figured it was kept clean. We went to the other side where we pulled six bags of garbage, a bag of recycling, a bag of cigarette buts, plus additional loose pieces. Example, we pulled two air mattresses out of the lake, maddening”. “There were some campers from Australia who were impressed with our company allowing us this opportunity. He hoped that his boss will start a program like our Cashco Cares when he returned. I gave him our Facebook information so they could check it out”. She also has unique shoe apparel. Roni recounts a funny moment with her co-workers. All in all thank you to Roni and Marie for showcasing Cashco Financial values, traditional or unique. We look forward to seeing all the ways you better your community. It only takes one person to make a positive impact, this case two. You can visit Roni at the Cashco Financial branch in Quesnel, B.C., to see how she can help you in the community, financially, or just to say hello.